Bri Gaal's Blog: Birthday Weekend! Birthday weekend has arrived! My birthday is May 25 and typically falls right around the Memorial Day holiday which is great because PARTY TIME! Kari said last night at the party Heather hosted for my birthday, "You know, you are the only person I know who has an actual birthday party every year." The day started out with a swim with Mary at TAC (I wonder sometimes when I type Mary if you all read that quickly as Marty). It just so happened that the pool was hosting the Black Heritage swim meet so that was pretty fun and funny. The good thing about TAC is even when there is a swim meet they always have lap lanes available in the other pool. And since most people take one look at the parking lot and turn right around, swimming during a meet almost guarantees your own lane. We had a good workout and enjoyed listening to the warmup music like "No Diggity." Then Kari picked me up for brunch, and dropped me off for a surprise from my sister and brother-in-law: a relaxing facial at a spa! I've never done this and it's so something I wouldn't ever do for myself so it was a really nice present. Marty and Logan picked me up and then it was off to the Honnold's for my birthday party :) It was so fun and such a great group of people. We were remarking today that no matter where you were there was always another fun person to talk to, unlike some parties, where groups form and you feel comfortable only in certain areas. I had not one but two birthday cakes, PLUS homemade cupcakes that had a birthday cake oreo inside!! I have definitely eaten my weight in sweets so far. This morning we did our last brick before the Raleigh 70.3 next week. Unfortunately, Marty couldn't do it as he has had some sort of bad stomach virus for a bunch of days now. Not going to lie, I'm sort of terrified I'm going to get it since we seem to pass everything back and forth. Fingers are crossed that I've somehow been spared. Anyways, a group of us met at Harris Lake to review the last part of the course. Although I've ridden the first 25 miles of this course hundreds of times (since this is our typical riding area), I've never ridden the end. It's narrow and much more trafficky so not bike friendly at all. It's rolling, much like the rest of the course. The weather was absolutely GOR-GEOUS today. Seriously, it was a ridiculously cool in the morning, sunny with no humidity topping out in the low 70's sort of day. I am so not going to be surprised when it's the opposite in one week, probably 90 degrees and humid in the baking hot sun. Because that's how these things work, right? And ugggghhhh, I'm wave 19 out of 21. Marty starts almost an hour ahead of me! But back to the ride - I had to wear arm warmers, how crazy is that? 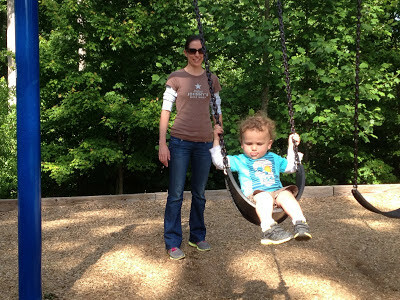 Later, we hit up a park with Junior Awesome.